After months of speculation, Royal Caribbean announced the name and details surrounding its fourth Oasis class cruise ship, Symphony of the Seas. Royal Caribbean revealed the name of the ship, along with some key details surrounding its sailings. Symphony will arrive in April 2018, and begin service by sailing the Mediterranean in Spring and Summer 2018. Symphony of the Seas will make stops at ports in Barcelona, Palma de Mallorca, Provence, Florence, Rome and Naples. In Fall 2018, Symphony of the Seas will cross the Atlantic to her new home in at PortMiami in Miami, Florida. From Miami, she will sail from Royal Caribbean's brand new cruise terminal that it broke ground on this morning. Symphony of the Seas will offer seven-night eastern and western Caribbean itineraries. Symphony of the Seas will be joined by sister ship Allure of the Seas, which will move from her current home of Port Everglades, Florida to Miami, Florida. Both ships will arrive just in time for the new ‘Crown of Miami’ cruise terminal to open, which will be a 170,000-square-foot terminal. Royal Caribbean touts this terminal will be the most innovative cruise facility in the U.S. with an expected $500 million in revenue and the addition of 4,000 jobs to Miami-Dade County. Symphony of the Seas will be the largest cruise ship ever, coming in at 230,000 GRT. 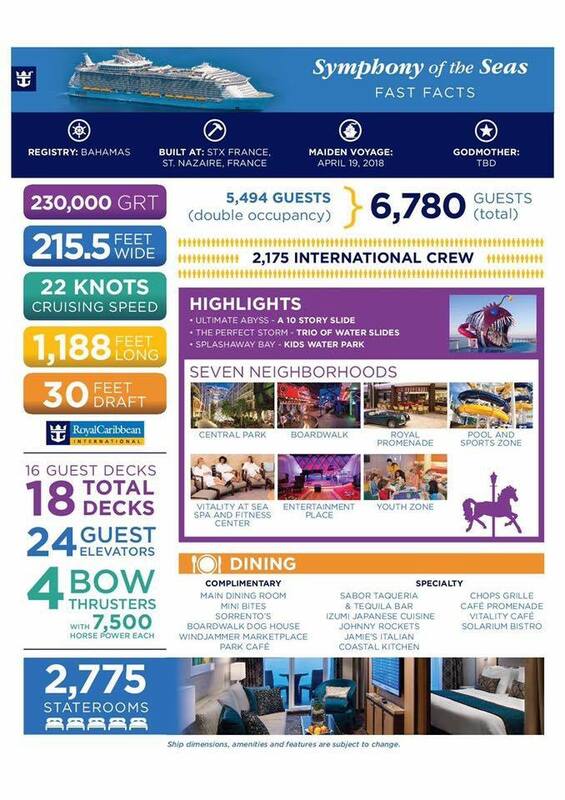 She will have 28 more staterooms than her sister ship, Harmony of the Seas, and be 215.5 feet wide and 1,188 feet long. This will make Symphony of the Seas just slightly larger than Harmony of the Seas. Video of Introducing Symphony of the Seas! Royal Caribbean did hint at something "daring" coming to Symphony of the Seas as well. The tease on Royal Caribbean's web site simply says, "Adventure hits a high note with a whole new challenge." Like the entertainment, Royal Caribbean is hinting at "a few new dishes" that will be available on Symphony of the Seas. Bookings for 2018-2019 Symphony of the Seas sailings opened late last night over the phone, but the public may now purchase any of her available sailings either online, on the phone or via a travel agent.